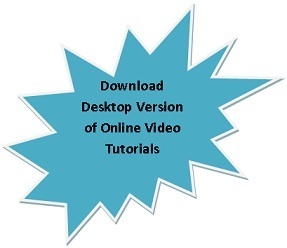 "VC++ In Easy Steps" is a set of VC++ Tutorials which helps you to learn VC++ quickly, using real time short videos. Using this VC++ Tutorials anybody who has knowledge in basic object oriented concepts can easily master VC++. These VC++ tutorials are divided into 9 lessons. Each tutorial is explained in detail with examples containing both source code and video. By practicing the examples in these VC++ tutorials anybody can become confident in VC++. A project work is also provided at the end to ensure your excellence. These VC++ tutorials will help you to learn VC++ yourself and you will become confident in developing real world applications in VC++ within a few hours. This VC++ tutorials assumes that you have some background in C and C++. Working knowledge of C++ concepts such as Inheritance, Member functions, Virtual functions, Polymorphism, Templates , Exception handling etc is an added advantage but not necessary. Minimum of 128 MB RAM, 256 recommended. Minimum 400 MB of Hard disk space. Minimum screen resolution 800 x 600. Windows Media Player Ver 6.X or above. Internet Explorer 5.X or above. The registration key generated will be specific to the hard disk configuration (Drive Partition number) of the machine. This key will work for this specific configuration of Hard disk only. KTS makes no warranty of any kind or re-issuing of another registration key if the user reconfigures the settings of the Hard disk or the hard disk is destroyed/crashed. So please configure the partitions of the hard disk appropriately before asking for the registration key. It is recommended that first you go through all the videos in these tutorials, then you will get roughly an idea about how things can be done in VC++. After that, come to each tutorial in a detailed manner by viewing the videos more than once and experimenting through the source codes. » Easy to learn VC++. » Tutorials with source & video. » All VC++ concepts in detail. » Can master within 9 hours. » Become confident in VC++ applications.